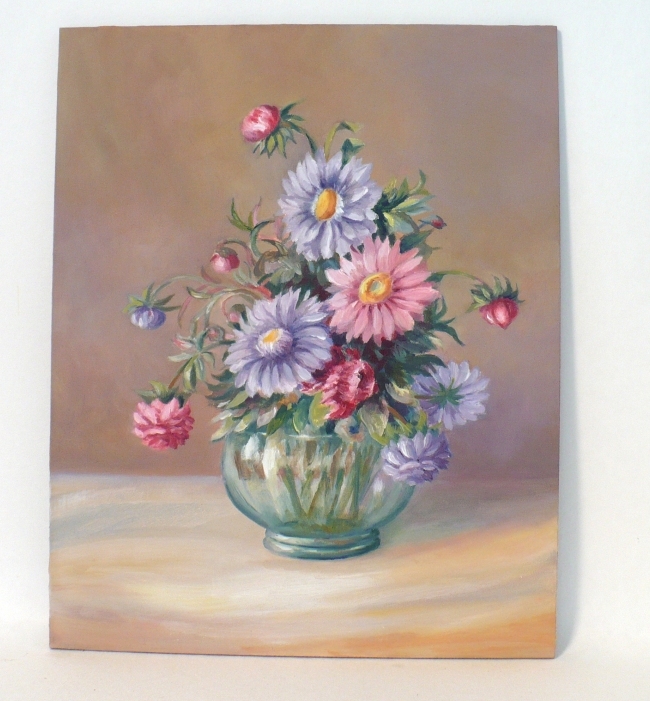 A request came in from a delightful gentleman for a painting to be done of a vintage floral still life print of a vase of asters which was published in the early 1900's by Edward Gross co. There was no artist name anywhere to be found on the print and he did not think it was of any great value. But the print meant a lot to him. Ouch! Poor print. The entire background was obliterated except at the edges which were concealed by the frame. 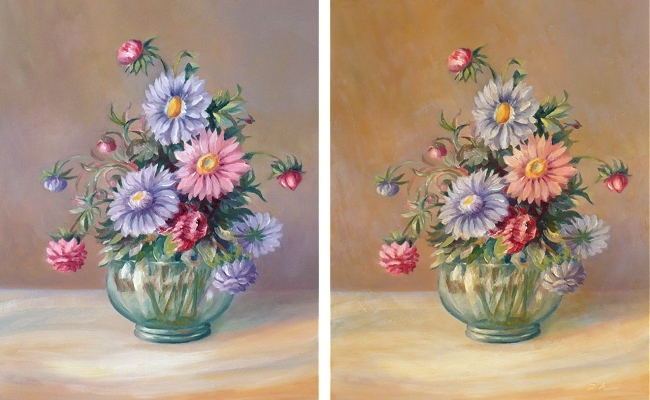 Most of the color, detail and contrasts in the flowers and vase were washed out as well. 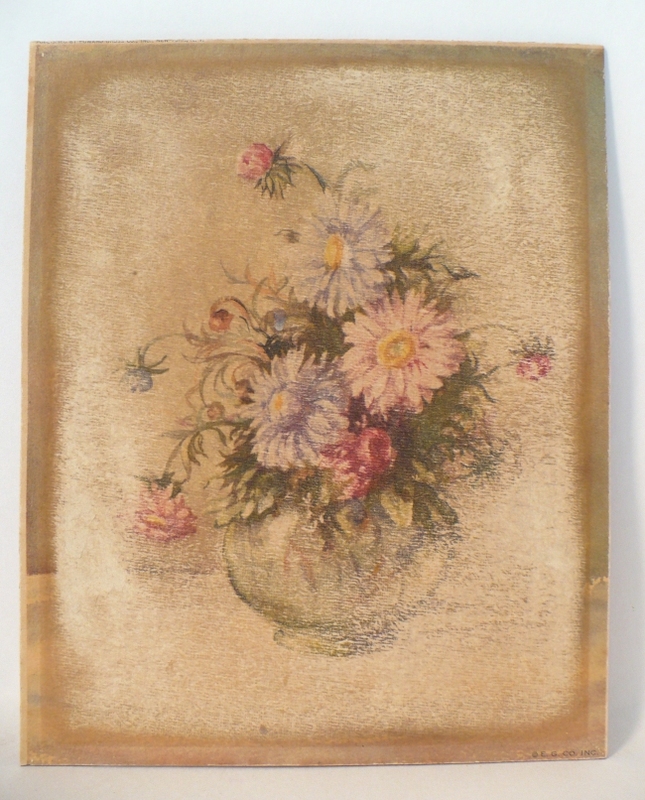 This was very distressing because the print had great sentimental value as you can imagine. 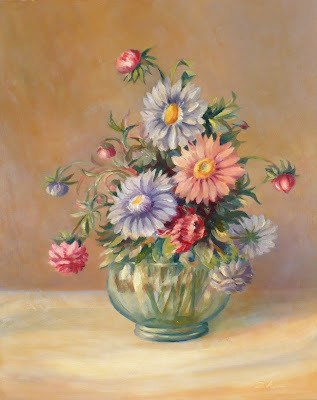 My mission was to do a new painting of this piece to restore the colors and detail to its former beauty. A little tricky considering what I was working from. There is one more problem. His print looked old because it had a yellowed cast giving an overall golden tone to all the colors and he wants that look. I'd never heard of antiquing a new painting (furniture, yes!) and was a little unsure of how to proceed. Googling this topic brought up nothing. "First the original was warm and more yellow because the varnish had become darker and yellower. This traditionally happens in older paintings...What he wants is an antique painting done today." 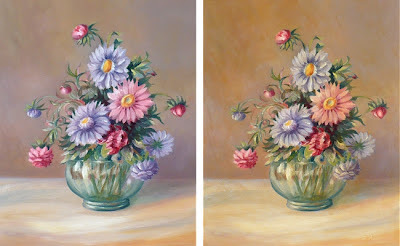 Though he said it was impossible to paint the aging that my client thought he remembered, he did give me some tips on how to go about getting a more yellowed look overall using a glaze of raw sienna. After about a week, it is ready for the glaze. I mix a tiny bit of raw sienna oil paint with a lot of Liquin. 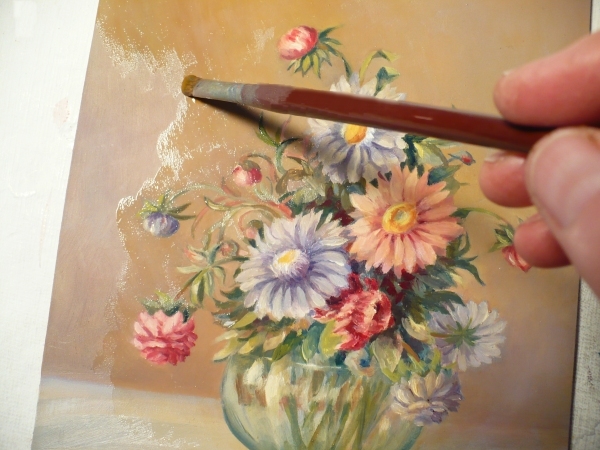 The Liquin is more flexible than oil paint alone, so the thin glaze over the other oils will flex as the oils underneath cure. This will help prevent crackling of the surface. "You've done a fine job! I'm sure that's as close to the original as anyone could ever get. 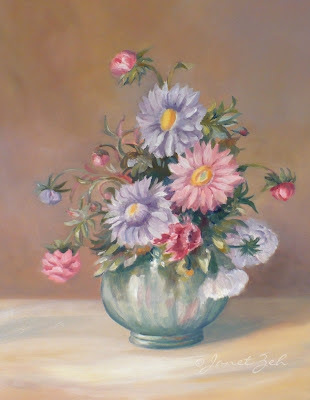 Thanks so much for all your patience and co-operation; I can't wait to see the painting reframed once more"
Hopefully he'll send a photo when it's framed so I can see it too.